We’d love your help. 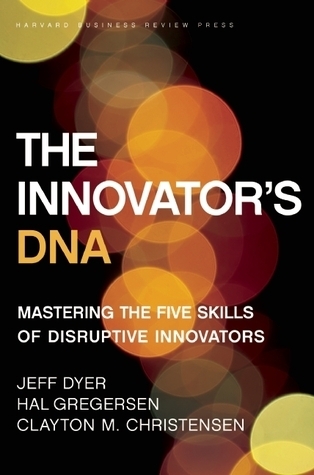 Let us know what’s wrong with this preview of The Innovator's DNA by Jeffrey H. Dyer. 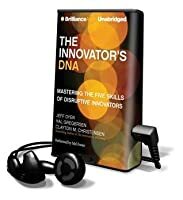 In The Innovator’s DNA, authors Jeffrey Dyer, Hal Gregersen, and bestselling author Clayton Christensen (The Innovator’s Dilemma, The Innovator’s Solution, How Will You Measure Your Life?) build on what we know about disruptive innovation to show how A new classic, cited by leaders and media around the globe as a highly recommended read for anyone interested in innovation. To ask other readers questions about The Innovator's DNA, please sign up. Here is another book review with perspective with how the content can be applied to education. This is how I always read my materials. This book was another fascinating read. I have been blessed to have read many great books in a row. This one is another one that all people should read. The authors conducted an eight year study that established 5 Skills that all innovators possess. When I Here is another book review with perspective with how the content can be applied to education. This is how I always read my materials. When I think of these five skills I don't think of successful people despite that many have these skills, but I instantly think of kids. All kids have these five skills. The key idea that I left this book with is that schools and society must change to quit killing these skills in youth. My young children possess these skills, but as they get older I fear they will lose these vital skills to be successful in life. It is hard to innovate when structure does not change and even more so in schools with such limited scope when educators are forced to fight for obedience instead of learning. The authors mention that large companies typically fail at disrupting innovation because top management team is dominant by people with delivery skills, not discovery skills. I think this holds true in some regards in education as well. The schools that deliver have administration that get it and work for discovery and testing the edge of chaos. How does your company/school reward and promote discovery skills? If we know that innovators and creators are going to be the face of change and the future of business, then we as educators and schools need to shift how we teach and the values we express. I think we are in a pivotal time that we must begin to change some things up. Not everything is broken, but we are in need of an update. This book was an essential read that left me with many great ideas to think about and items that I need to address. My current goal as a result of this book is to create a place for teachers to come tinker, explore, question, observe, and experiment. I am calling it Tinker Time and it starts this week. I will continue to push myself as an educator to allow more of these 5 skills to develop in my classroom and school. It took a sheer force of will to finish this because a friend of mine wanted to borrow it. At the conclusion of my first reading, I felt like I had heard the same quotes and same ideas over and over so many times that I marveled how Jeff Dyer, Hal Gregersen could write the same chapter 10 times and get Clayton Christensen to let them put his name on it (I say that because I don't ever sense Clay's voice throughout the mini-tome). The book is so repetitive, I had to wonder if they had put on an e It took a sheer force of will to finish this because a friend of mine wanted to borrow it. At the conclusion of my first reading, I felt like I had heard the same quotes and same ideas over and over so many times that I marveled how Jeff Dyer, Hal Gregersen could write the same chapter 10 times and get Clayton Christensen to let them put his name on it (I say that because I don't ever sense Clay's voice throughout the mini-tome). The book is so repetitive, I had to wonder if they had put on an essay contest where they said: "Write about how to innovate, and you must mention the Google vs. P&G swap, the Apple "Think Different" ad campaign, and you have to talk about T-shaped people." But, you have to keep in mind that this is a book written by academics. It's not supposed to be entertaining, so any entertainment value to be gotten from it is a bonus. The book sometimes come across so supremely satisfied with its own ideas that you think that the authors believe that they invented IDEO and were responsible for teaching Steve Jobs et al the secrets of innovation. I finished the book thinking I would give two stars to the trio who came off as a pack of bright and excited Cutco salesmen (or life insurance or pest control or security systems, whatever kind of salesman you need to understand the off-putting excitement over something so highly unexciting). But, as is my custom, I went over the book again to insert the marked quotes into my UberQuotation catalogue (1754 quotations logged and counting). As I re-read some of the portions that I had marked months ago before I started dragging my feet through this slog of repetition, I saw the beauty of the book for what it was: a simple, straightforward recipe for how to innovate methodically and systematically. I noticed how my behavior towards approaching problems had indeed changed because of some latent residual wisdom I had gained from reading. I did indeed focus more on asking questions as opposed to my former method of jumping in to solve a problem. I had indeed made an effort to network with people just for the pleasure of learning from them. I was less afraid of experimenting because something told me that I needed to "fail often to succeed sooner." In reading Innovator's DNA, a little piece of it became fused into my own DNA. For which I, too, was so supremely satisfied. Didn't really like it. Too much Steve Jobs boosterism, and I don't agree with the basic premise that if we all get to be better innovators, we can be like Steve Jobs too. That's not really a goal I aspire to, frankly, nor do I think it's possible. However, there is some helpful language here that will help those in the delivery chain think more creatively about discovering areas for improvement. Insight comes from exposure to different ideas, experimenting and reflecting. This is no big news, I don't see what all the hype is about. But I suppose that if you find this book useful, then maybe you indeed needed it in the first place. Really really like the authors advice...but know it is damn hard to implement. This one made me feel deceived. I'm a huge fan of Clayton Christensen, whose books The Innovator's Dilemma and The Innovator's Solution blew my mind and brought important frameworks and concepts I use all the time in my equity investing profession. Seeing the title and Mr. Christensen listed as one of the authors, I was fooled to believe this was another member of his innovator's series. Actually written by Jeffrey Dyer and Hal Gregersen, Clayton acted more as an advisor and premium rev This one made me feel deceived. I'm a huge fan of Clayton Christensen, whose books The Innovator's Dilemma and The Innovator's Solution blew my mind and brought important frameworks and concepts I use all the time in my equity investing profession. Seeing the title and Mr. Christensen listed as one of the authors, I was fooled to believe this was another member of his innovator's series. Actually written by Jeffrey Dyer and Hal Gregersen, Clayton acted more as an advisor and premium reviewer on this one - and as a book bait to Clayton's fanboys like me. The lack of innovation on the ideas presented on the book can tell. The authors could have eaten more of their own cooking and apply the advice on the text to actually come up with ideas that haven't been said for about 875,327 times by now. Are they serious they wrote a whole book to bring the message that innovators practice association, questioning, observation, networking and experimentation? The age of the book is not an excuse, as when it was published in 2011, when these "innovator's skills" were more than known. Don't get me wrong. The authors were behind a very extensive study on innovation in the corporate world and I praise their work and effort. But doing all that to support conclusions that were 100% already expected doesn't turn into a worthwhile book. The concepts are great and definitely worth incorporating into your daily life, but all of the important information can be found in the HBR article they wrote - the book just adds anecdotal stories from the lives of successful innovators. Some of the cases were so tied to business that I found them contradictory when trying to apply them to the citizen or government sectors. There are 4 skills to practice, which culminate in the skill of association, or connecting various fields and ideas. That The concepts are great and definitely worth incorporating into your daily life, but all of the important information can be found in the HBR article they wrote - the book just adds anecdotal stories from the lives of successful innovators. Some of the cases were so tied to business that I found them contradictory when trying to apply them to the citizen or government sectors. There are 4 skills to practice, which culminate in the skill of association, or connecting various fields and ideas. That's because the most interesting combinations are often discovered at the intersections and boundaries. Excellent book for leadership today - describes how to imagine and invite improvement, not be afraid of change, and even seek out new (innovative) ideas. Good, but nothing earth-shattering here. Проблема всех книг по инновациям: они пытаются научить мыслить креативно, нестандартно, а это всё равно что попытаться науч Если вы до этого ничего не читали по теме инноваций, то возможно книга вас заинтересует, покажется интересной, а возможно даже и важной. Однако лично для меня это уже далеко не первая и даже не третья книга, которая затрагивает тему инноваций и/или близлежащие темы. Возможно, именно из-за этого я нашёл её хоть и простой в плане чтения, но довольно самоочевидной в плане идей. I bought hardcopy of this book from amazon and read it in a week. It simply classified five different discovery skills that person can develop by practicing. The author highlighted stories of many innovative companies and owners as an example for every discovery skills. He suggested that discovery skills such as associating, questioning, observing, networking, and experimenting are found in innovative people and recommended building these skills, if you don’t have them from birth. At the end of I bought hardcopy of this book from amazon and read it in a week. It simply classified five different discovery skills that person can develop by practicing. The author highlighted stories of many innovative companies and owners as an example for every discovery skills. He suggested that discovery skills such as associating, questioning, observing, networking, and experimenting are found in innovative people and recommended building these skills, if you don’t have them from birth. With exemplar innovators and successful innovating companies examples this books dwells on the whys and hows of their essence as innovation agents in under to help the reader understand what needs to be done to be an effective innovator. The book is divided into two chapters, one for individuals and one for companies. The regular reader may find the insights useful and might want to incorporate a couple of suggestions into their life. However, as most management books, the ideas and suggestions With exemplar innovators and successful innovating companies examples this books dwells on the whys and hows of their essence as innovation agents in under to help the reader understand what needs to be done to be an effective innovator. The book is divided into two chapters, one for individuals and one for companies. The regular reader may find the insights useful and might want to incorporate a couple of suggestions into their life. However, as most management books, the ideas and suggestions seem to be oriented more to the director of projects/divisions and CEOs. The book, probably the final chapter of Christensen’s “Innovator’s Trilogy”, fits in a fresh category of innovation books that talk about people behind innovation rather than innovation itself. The result of an “eight-year collaborative study” reveals some of the personality treats of the top innovators and the innovation processes followed by top innovation companies. The first part of the book presents the reader with five skills identified by the authors as “distinguishing innovators from typical executives”. The second analyses these skills put into practice in the business environment from three perspectives: people, process and philosophies. Success innovation stories of individuals are used as examples to highlight how a particular skill helped a particular innovator come up with a particular product or service. Be prepared to dive into the mind of Steve Jobs, Mike Lazaridis, Michael Dell and other prominent figures of the innovation world. In the second section, the stories help you understand the big picture: that is how the five skills come together and define the kind of people that work in a company, how the company manages its processes and what the companies’ philosophy towards innovations are. Examples of real companies serve as introduction to each to the discussions. As soon as you start reading you can see the “Halo Effect” (Phil McKinney) shine over this book. Although the authors claim that their method to find innovative companies is more accurate than just picking the Business Week’s annual ranking of innovative companies, it still generates some doubts. Their measure, “innovation prowess”, based on the firm’s market value vs. the cash flow attributed to current businesses seems to lack a validation that the difference can be only attributed to investors expecting the company to get future profits from innovation. What other factors may affect investors? Where this factors taken into account and balanced out during ranking? These issues are not addressed in the book. Innovators where asked to fill a survey and the results used to identify the differences between innovators and non-innovators in the five innovation skills. Percentiles in the scores are used to back up the points and findings described in the book. Are the differences between innovators and non-innovators significantly different? Don’t get me wrong, the argument of the book is interesting and well-structured and gives an interesting view of innovation, it is just not clear enough if the data fully backs the argument. As with Beyond the Obvious you will probably find the chapter about questioning one of the most educational. The four tactic questioning can prove to be a valuable tool when thinking out of the box and finding new, innovative, products. If you ever left a classroom or conference feeling that you should have raised your hand and asked that question, then you will find the side note about “willing to look stupid” most insightful. Questioning in order to see beyond your present and to challenge the status quo can be the most important tool in an innovator’s tool set. If you are into process, marketing or other type of area that is not product development you are in for a treat. Although sometimes used as small examples, innovations that are not products seems to be regarded as not as innovative as a product. How the skills can be applied to innovations in other areas is completely disregarded. Another interesting point is that the book excels at demonstrating success examples. But what of how did these innovators tackled failure? How to explain when one of their skills failed and led them to slow or not reaction at all? The networking chapter starts with the example on how Lazardis’ networking helped him shift RIM from LED panels to two-way pagers, later BlackBerry. But what happen to this networking as RIM started to lose ground against smart phones? Innovators need to have the courage to innovate and know that making a change “makes it much easier to take smart risks, make mistakes, and most of all, learn quickly for them”. But how are the five skills key to learn from mistakes? Are there other skills needed to identify mistakes, accept defeat and learn from the process? Some good information about well known innovators, their companies, and their processes. It was interesting to note that the authors’ assessment for innovation did not include GE in the top 25 innovative companies; yet, Business Week ranked it number 5. In effect, the authors predicted GE’s recent downfall. (This Book was published in 2011). Overall, I found some of the information repetitive. I would have ranked it higher if they had edited their work more carefully. A very educational book. The five skills mentioned in the book are essential to innovator. The book gives a lot of insightful case studies. A must read for us considering how to seriously face the fast-pace future. This book is also very help if we think of how to make our children to be more innovative. What a useful book. Often, when I pick up a book in this genre, a good part of it is floof... extra words, things to make it longer. Not this book. This book is solid muscle. No fat in it whatsoever. It’s cold, hard, applicable information. If there was ever a good textbook on to how to be more innovative, this is it. Kudos. I read this while taking a class from Professor Dyer on the topic and felt that it had some great content and examples. I love the perspective that innovation is something we can learn and the simple construct of the discovery skills as a helpful way to start. Definitely recommend in connection with Innovator's method for those trying to create a new product or service. I was wavering between two and three stars. Here is the thing -- if you are going to write about innovation, why do you do it like everyone else? More cult of Jobs/Bezos/Page sycophancy. The book could have used a little innovation to differentiate it from EVERYTHING else on the market that is exactly the same. While backed with sound empirical research, this book feels like the authors had a contract that included a specified number of pages. Come hell or high water, they were going to have that many pages. An insightful book. By giving methodologies to help improve the general innovativeness it is very prescriptive with examples. A well researched and documented book. The main challenge will be implementing the ideas given by the authors. This was an excellent read on the techniques us "average Joe's" can use to become more innovative in our day to day working. It is essentially a blueprint for greatness for those of us so inclined. Although this book was necessary for my course I will use this information forever. Must read for all leaders. Thanks!!! Pretty dated. Hard to take Blackberry as a model of innovation leadership seriously. Or Dell. Or P&G. Or Salesforce.com. A great refresher and in-depth understanding of the Disruptive Strategy course which I took at HBX Harvard. Additional examples and practical real-life applications. Summarizes the 5 essential skills or "DNA" of innovators - associating, questioning, observing, networking & experimenting. Infused with examples of inventors and innovators. Repetitive and lacking of new insights - if you've read business books before. The usual suspects (Jobs, Bezos etc) quoted with average anecdotes.